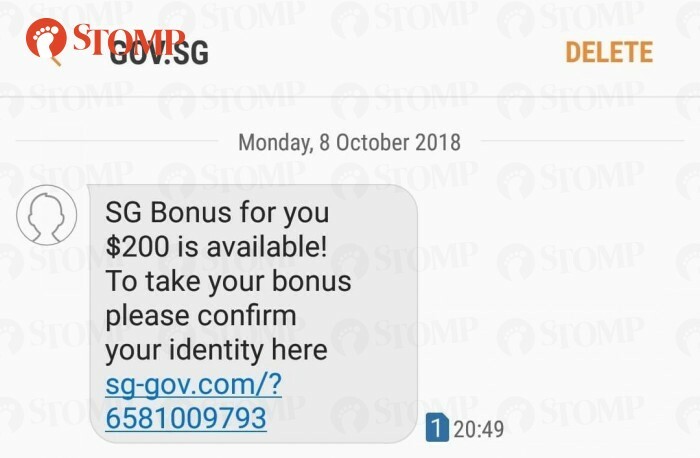 Several Stompers alerted Stomp to a text message informing them that they are entitled to claim $200 as part of the SG Bonus. The SMS includes a clickable link which leads to a page requesting for personal details. Stomper Dean, who received a screenshot of the text message from a friend at around 2pm on Oct 9, was quick to point out its suspicious nature when he saw that the link leads to a page requesting for personal information. "This is a scam!" said Dean. "The government would not need our details to give us our bonus. "They have all our details!" Another Stomper, who also received a screenshot of the message from a friend, pointed out that governmental websites usually end with ".gov". 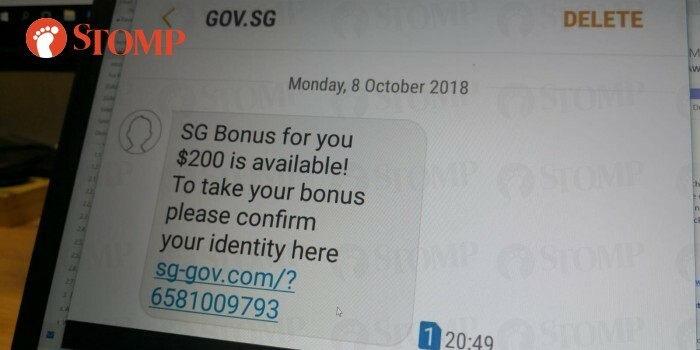 The website listed in the SMS ends with "gov.com". Stomper Ah Boy received the message directly on Oct 9 at about 5.45pm via SMS on his phone. "When I received it, I already knew it was fake after reading about it on Facebook earlier," he said. "Anyways, the website on the SMS does not tally with governmental websites. "As I knew this was not genuine, I did not do anything with it." Another recipient of the screenshot, Stomper Goh, said: "I just want to share with others out there that this is a fake SMS. "This SMS is circulating around WhatsApp." In light of such scams, the Ministry Of Finance (MOF) uploaded a post on their Facebook page to warn citizens about the scam and how they can differentiate an official SMS by them from the scam ones. 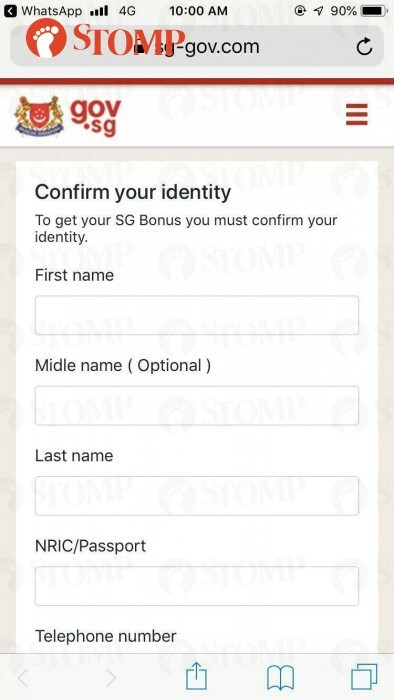 According to the post, those who have registered their mobile number with SingPass will be receiving an SMS notification from MOF. In order to know that the SMS is legitimate, one should look out for key features such as the sender's name and the inclusion of your NRIC number with the last three numerals and letter showing. "Be mindful of any fake texts, emails or calls," said the caption on the Facebook post. Screenshots of a legitimate SMS from MOF can be found in the post.